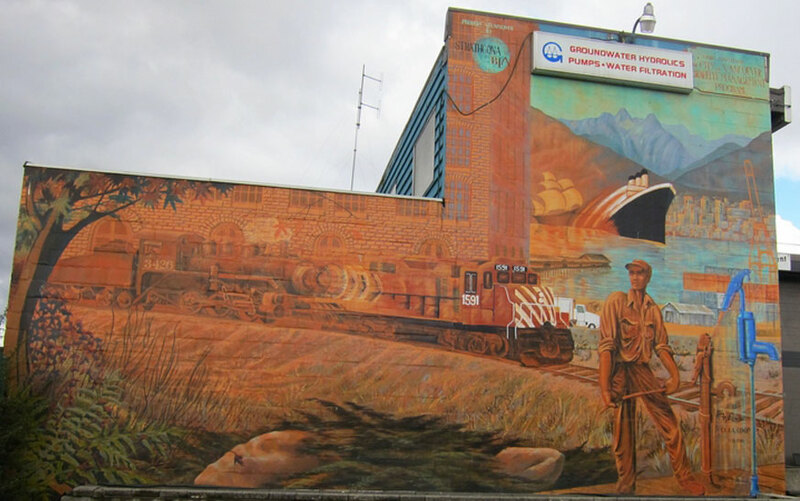 The Groundwater Hydraulics Mural speaks of transition, with an old train morphing into a new, an old ship morphing into a modern liner, an old pump morphing into a new, an old color (sepia) morphing into a new. In the foreground is a young man who symbolizes the blue-collar origins of the area. Total mural: 700 sq. ft. approx. Acrylic on concrete block. Six persons were employed through Sandy MacKiegan and CETA Coop. Paint and scaffolding were provided by the Vancouver Graffiti Mgmnt Program. Sponsorship was by the Strathcona Business Improvement Assn.